Kalani Engles and Bonny Novesky have been invited to participate in the inaugural Portola Valley Cultural Committee exhibition at the Kriewall-Haehl Gallery at Woodside Priory from October 3rd to November 5th, 2011. 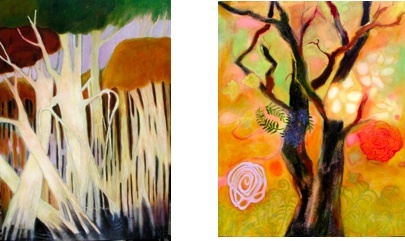 Two of Kalani’s large oils on canvas (see below) and three of Bonny’s acrylic prints will be on display. Seven other Portola Valley artists will also be featured in the show. An Artists' Reception from 4:00 to 6:00 pm on Saturday, October 15th will feature local wine and hors d'oeuvres accompanied by music performed by Portola Valley musicians Angela Schillace and Kari Rust. Woodside Priory is located at 302 Portola Road, Portola Valley. Gallery hours are 3:00 to 6:00 p.m., Monday through Friday. I have visit to your blog and i am very inspired by read your article and seen by pics such a very nice blog and hope you soon update your blog with new posts and carry on these types blog posting.